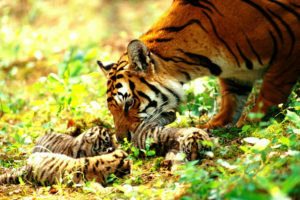 Home > Blog > Good News: Wild Tiger Populations are Increasing! Tigress P-222 sighted with 3 cubs in Panna. HERE’S a good news for wildlife lovers that three new born tiger cubs were spot-ted with tigress P-222 at Panna Tiger Reserve (TPR). Sighting of three cubs is a good sign for Tiger Reintroduction Project at Panna Tiger Reserve started in 2009 as tigers’ population has registered a significant growth and the number has raised to 37. Panna Reserve Field Director K S Bhadoriya informed that tigress P-222 was recently seen with her three cubs in a camera. Images are likely to be two months old, but it has been confirmed that P-222 tigress gave birth to three cubs for the third time. Earlier, she gave birth to two cubs twice. Panna Tiger Reserve was left with no tiger in 2009 due to various reasons and poaching was one of them. Madhya Pradesh Forest Department had started Tiger Reintroduction Project with transloca-tion of a pair of big cats from other tiger reserves to review population of tigers.